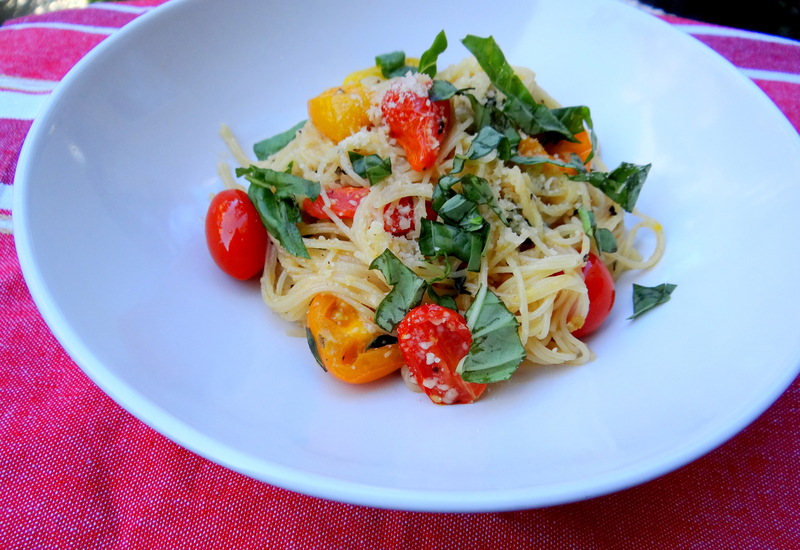 I was craving pasta and looked inside my fridge to see what I had and decided to throw it all in a pan.. and that is how I made this very simple and yummy pasta dish: capellini with tomatoes and basil. It was a great way to get rid of extra ingredients and even though there weren’t a lot of ingredients, it ended up being very flavorful. It’s one of those dishes that you can make based on what you like. You can revise and add anything more.. if you want it more garlicy, chop up some more garlic or if you like spiciness, add more red pepper flakes. You can also add other veggies you might have (ie: bell peppers, onions, spinach) but I like the simplicity of the dish. 1. Boil water in a pot for the pasta. Make sure to add salt before you add in the pasta. I am actually the worst at measuring pasta so even though I meant to make pasta for one, there was enough pasta for two. Oops. 2. Add olive oil to a pan on medium heat and then add garlic, salt, pepper and a pinch of red pepper flakes (or more if you want more of a kick). Cook it for about 20 seconds and then add the tomatoes & basil until the tomatoes get soft. 3. Add the cooked pasta directly into the pan. I like having some of the pasta water in the pan so that it helps to create more of a sauce and the pasta doesn’t get dry. 4. Sprinkle the cheese & mix in. Add more cheese on top & fresh basil if desired.